This treadmill is in a class all by itself. It is without a doubt the simplest and most space conscious treadmill for home gym use on the market. The users for this treadmill are the people that want to walk or job every day at leisurely to moderate speeds. It has a small 1.5 CHP motor that is very reliable but with the trade off of a top speed of 6 mph. Yet, if you’re only looking to stay active and fit, that’s all you need. The low cost is attractive for the flexibility and reliability you get when compared to the larger more fully featured models. Yet, this treadmill has some nice features beyond just the belt and motor that makes your encounter with this machine pleasurable and effective in staying active and fit. I have read many reviews this product has received and compared them with my on perceptions. The machine has been well received, with users commenting on the things that matter to the home gym user. The treadmill is easy to assemble and store. You get an effective workout. Then, there are the people you can never seem to be please and complain about there being no place to put your water bottle when exercising. 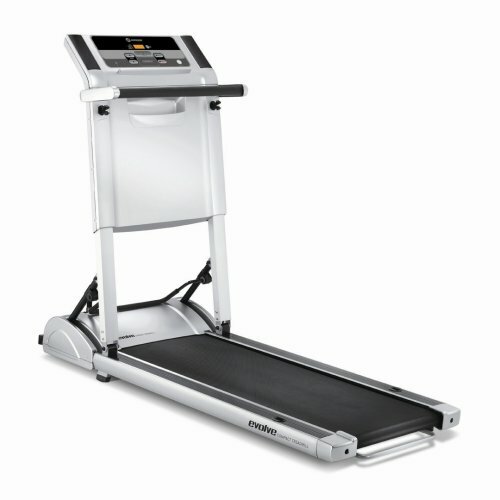 I would characterize the Horizon Evolve SG treadmill as semi-compact rather than fully compact as described. While it has a smaller footprint than most, it is still bulky and not simple to move when you need to reconfigure the home gym. The 1.5 CHP motor is small enough to run quietly and won’t interfere with listening to movies, TV or MP3 player. The running space isn’t as wide or long as other treadmills in the home gym category but then the price for those larger machines is also considerably more. There is really only one automated feature offered on this treadmill and that’s the one 30 minute pre-programmed exercise routine with speeds varying from 2 mph to 4 mph with approximately a quarter of the auto work-out at the higher speed. The instructions call for a separate warm up before using the machine but I find that doing to or three minutes in manual at the 2 mph setting is a perfectly fine warm up before starting the automatic program. The 1.5 CHP motor is suitable for the light use this treadmill is expected to receive. If you push the limits, motor performance begins to strain just a bit. So, stick to walking and light jogging. The lack of a deck cushioning system also makes it advisable to reduce impact injuries to joints and back by keeping the pace relatively slow. If you respect the design limits of the machinery, the performance of this motor and deck is superb. This is not a complicated machine. It’s simplicity makes it a pleasure to use. The display functions may frustrate you at first with its elemental features but once you learn what the machine can give you, the adjustments are simple. The raising and lowering of the deck for storage is easy but the deck is heavy and requires some effort to put it up and down. There is no automatic raising and lowering. It’s all manual. Set-up of the running belt and deck is trick and not included in the manual. It is attached to the machine is a small ticket. It tells you to run machine for 60 minutes before first use. Don’t skip this step. If you don’t break the machine in unloaded at first, you will find the belt too far to the right or left side. If it happens, follow the instructions in the manual to make the adjustment and be patient or the belt will soon be too close to the other side. It requires 30 seconds or more for the effects of a quarter-turn adjustment to be fully realized. Also, there is no cushioning effect engineered into this running deck. The impact to your joints and back will be noticed. This is a basic machine with very few special or extra features. If you’ve used higher end machines, you won’t be impressed with the simple features of this machine. However, the god news is that you didn’t have to go to the gym to use it. You were able to go right to the machine after your first cup of coffee and get in your workout with time left over to shower, dress and get to work on time. 1.5 continuous horsepower motor (CHP). Speed ranges from 1 mph to 6 mph. Instant stop with just a pull of the console safety key. A maximum user weight of 250 lbs. Has two built-in workout programs, manual and weight loss. 17 x 45 inch deck area, 2-watt audio speakers with input jack (nice touch but underpowered). Accommodates most walking and jogging strides with having to alter them. Electrical connections are not convenient and the power cord is too short. The control panel has space that is wasted where additional operating options could be installed vice just manual and one automatic routine. The instruction manual has some glaring omissions but is otherwise helpful and clearly written (make no reference whatsoever to operation of the built-in stereo speakers). Overall, the Horizon Evolve SG treadmill was simple to assemble and easy to set up (provided you saw and heeded that little card about doing a 60-minute break in before jumping on it). The operation was smooth and comfortable between the 1 to 6 mph speed limits. When I was ready to end the exercise period and pulled the safety disc out of the slot, the machine stopped immediately. There was no concern to my safety when stepping off the deck to the stationary floor. I’d love to give this machine a higher rating but some of the glaring oversights are inexcusable. Rated at 3 of 5 when compared to other machines in its home gym class.